Download "COURSE OUTCOMES: Upon successful completion of CUL 1010 students will:"
1 Nashville State Community College Business & Applied Arts Division Culinary Arts Course Syllabus: CUL 1010 Hospitality Management Term: Instructor: Office: Office Phone: Home Phone: Office Hours: Should these hours not be convenient to your schedule, please contact me for an appointment. Monday Tuesday Wednesday Thursday Friday It is the student s responsibility to check D2L and MyNSCC on a regular basis. These are the official communication channels between the college and students. Students are responsible for the information communicated through those channels. D2L contains specific course information and MyNSCC contains information important for other purposes. 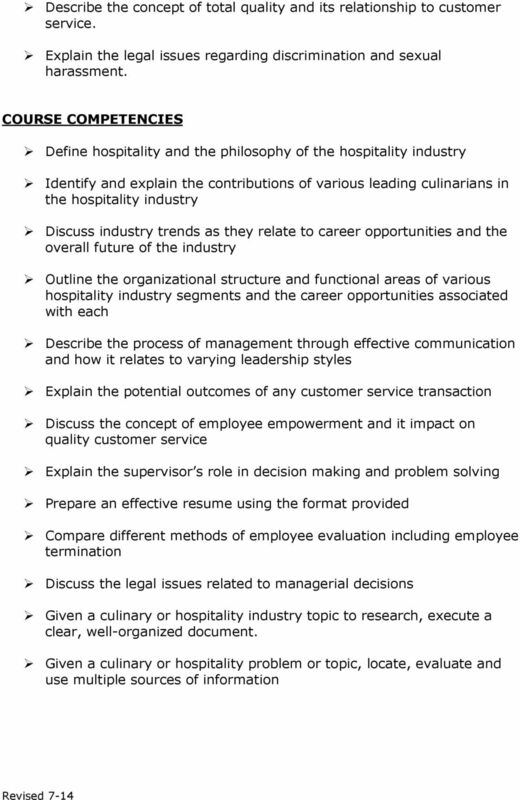 COURSE DESCRIPTION An introduction to the hospitality industry and the chef as supervisor and manager. Topics include the organization of industry segments, services provided by the lodging, food and beverage industry, career opportunities, principles of supervision, communication, motivation, total quality, leadership, training, and team performance. 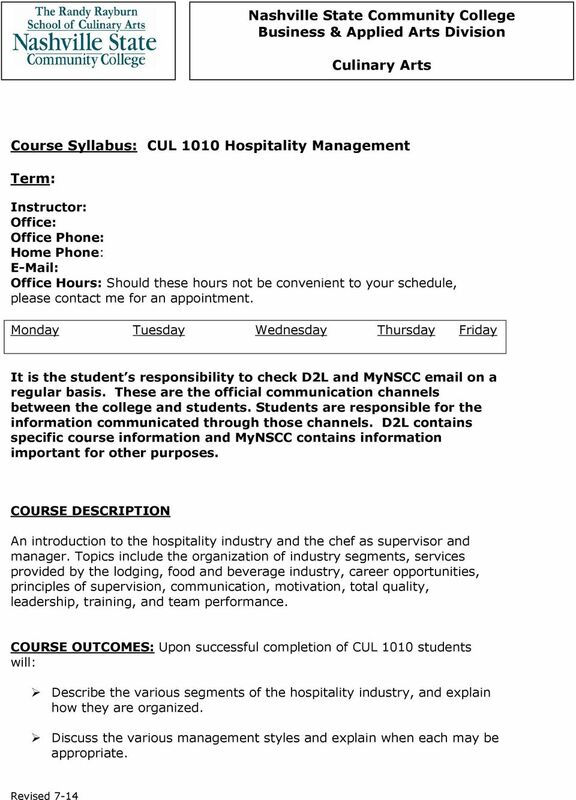 COURSE OUTCOMES: Upon successful completion of CUL 1010 students will: Describe the various segments of the hospitality industry, and explain how they are organized. Discuss the various management styles and explain when each may be appropriate. 3 TEXTBOOK Hospitality & Culinary Arts, Pearson Publishing, 2010 ISBN: Please be advised that this is a custom text and can only be purchased from the Nashville State Bookstore. GRADING CRITERIA 10% Attendance and class participation 30% Term Project 20% Quizzes see course schedule 20% Mid-Term Exam see course schedule 20% Final Exam see course schedule Mid-term and final exams will be comprehensive in nature with the format being primarily short answer type questions. Each will be graded to a value of 100 points. You and your classmates determine amount and degree of exam review. Quizzes will cover material discussed at intervals and will be similarly formatted to the exams graded to a value of 20 points. Make up quizzes and exams will only be arranged if you have given the instructor prior notice that you would be unable to attend a regularly scheduled testing date. You will be responsible for arranging a suitable time to make up the test which is convenient to your instructor. GRADING SCALE A = % B = C = D = F = below 60 ATTENDANCE POLICY A student is expected to attend all scheduled classes and laboratories. Each instructor will formulate an attendance policy and provide it on the course syllabus. Absences are counted from the first scheduled meeting of the class, and it is the responsibility of each student to know the attendance policy of each instructor in whose class he/she is enrolled. If a student is absent from a class, he/she should give an advanced explanation to the instructor. 5 exam, paper, or assignment, recycling your own work from another course, purchasing papers or materials from another source and presenting them as your own, attempting to obtain exams/materials/assignments in advance of the date of administration by the instructor, impersonating someone else in a testing situation, providing confidential test information to someone else, submitting the same assignment in two different classes without requesting both instructor s permission, allowing someone else to copy or use your work, using someone else s work to complete your own, altering documents, transcripts or grades, and forging a faculty/staff member s signature. 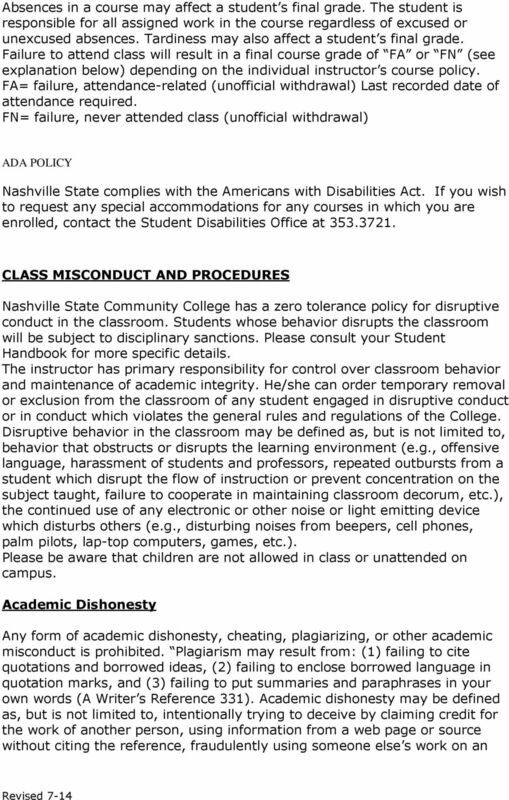 In addition to other possible disciplinary sanctions that may be imposed through regular college procedures as a result of academic dishonesty the instructor has the authority to assign an F or a Zero for the exercise, paper, or examination or to assign an F for the course. Students may appeal through the appropriate college grade appeal procedures. 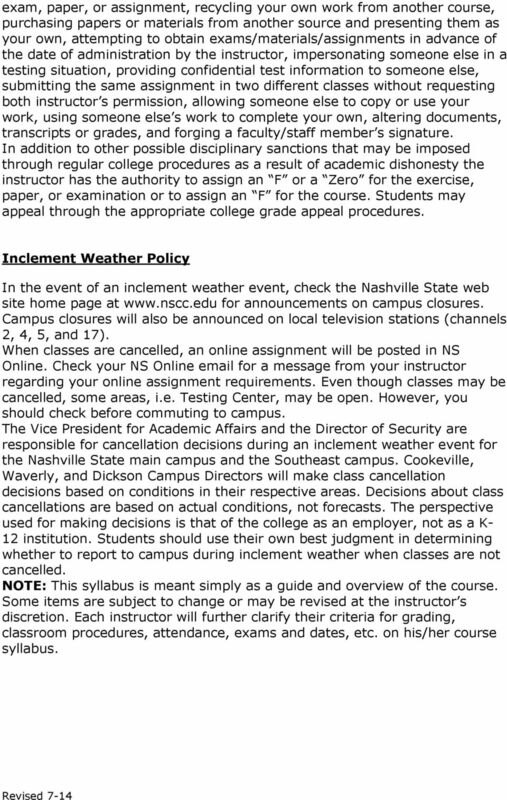 Inclement Weather Policy In the event of an inclement weather event, check the Nashville State web site home page at for announcements on campus closures. Campus closures will also be announced on local television stations (channels 2, 4, 5, and 17). When classes are cancelled, an online assignment will be posted in NS Online. Check your NS Online for a message from your instructor regarding your online assignment requirements. Even though classes may be cancelled, some areas, i.e. Testing Center, may be open. However, you should check before commuting to campus. The Vice President for Academic Affairs and the Director of Security are responsible for cancellation decisions during an inclement weather event for the Nashville State main campus and the Southeast campus. Cookeville, Waverly, and Dickson Campus Directors will make class cancellation decisions based on conditions in their respective areas. Decisions about class cancellations are based on actual conditions, not forecasts. The perspective used for making decisions is that of the college as an employer, not as a K- 12 institution. Students should use their own best judgment in determining whether to report to campus during inclement weather when classes are not cancelled. NOTE: This syllabus is meant simply as a guide and overview of the course. Some items are subject to change or may be revised at the instructor s discretion. Each instructor will further clarify their criteria for grading, classroom procedures, attendance, exams and dates, etc. on his/her course syllabus. Revised: 04/27/15 Nashville State Community College Business & Applied Arts Division Music Technology Master Course Syllabus This master course syllabus is meant simply as a guide and overview of the course. BIOL 1004 SYLLABUS. COURSE OUTCOMES: The student will demonstrate knowledge of the parts and functions of a cell. 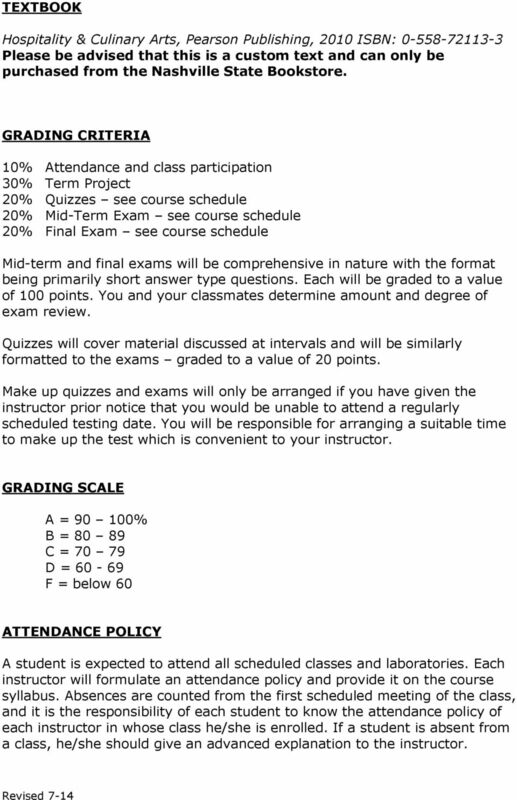 General Psychology HONORS PSYC 1030 CRN: This Course Outline is subject to change with notice. The mission of Motlow State Community College is to enrich and empower its students and the community it serves. General Psychology HONORS PSYC 1030 CRN: This Course Outline is subject to change with notice. PSYC 1030 and documented eligibility for collegiate level English. This four (4) credit hour. Students will explore tools and techniques used penetrate, exploit and infiltrate data from computers and networks. Describe the unique legal, financial, and regulatory attributes of tax-exempt entities. Mission of the Hospitality Management Program: Create, share and apply knowledge to develop leaders for the hospitality industry. Other Requirements: USB drive, Internet Access and a campus e-mail address. Course Description: Examines the basic elements of marketing theory, terminology and concepts with emphasis placed on analyzing consumer motivation. Required Textbook: Sciarra, Dorothy June, Dorsey, Anne G., Developing and Administering a Child Care and Education Program, 7th Edition. Course Syllabus. Senior Project Studio. Course Description: Students begin the design and production of advanced interactive project. INTRODUCTION TO CRIMINAL JUSTICE 101 - FALL 2015 Instructor: Tom Pritchard Office: D-200C Office Hours: M/W 7:30 a.m. 8:20 a.m. E-mail: thomas.pritchard@bellevuecollege.edu Tuesday 11:30 a.m. 12:20 p.m.